Command Sergeant Major Vernon Day began his military Career in West Texas in 1959, enlisting in the 142nd Infantry Battalion of the Texas Army National Guard. He completed basic combat training at Fort Ord, California in January of 1960, and returned to Texas as an Infantryman. He served as an Infantry Squad Leader, Platoon Sergeant and First Sergeant in the 2" Battalion, 142nd Infantry, 2nd Brigade, 49th Armored Division. Command Sergeant Major Day advanced to the rank of Command Sergeant Major of his Battalion on March 28th, 1991. As a member of the Board of Directors of the National Guard Association of Texas, Command Sergeant Major Day served with enthusiasm and distinction in the offices of Secretary, Treasurer and Director. As Director, he led the way for new equipment procurement, training site improvements and increased benefits for Guardsmen and their families. Traveling countless numbers of miles, Command Sergeant Major Day frequently visited with the leadership of the Texas Legislature and the United States Congress to tell the "Guard's Story" and to muster legislative support to insure funding for equipment, training and repair parts. His tireless efforts led to increased recognition of Guardsmen and women and improved the well being of soldiers and their families. The Association presented Command Sergeant Major Day its prestigious "Minute Man" award, for distinguished service to his state and nation, on March 26th, 1988. Retirement did not slow the pace of Command Sergeant Major Day. As a life member of the Enlisted Association of the National Guard of the United States, he continues to seek and solve issues of concern for Guardsmen and their families. An icon of the community in his hometown of Wellington, Command Sergeant Major Day is a Master Mason and member of the Board of Directors of the Wellington Sheltered Workshop. He continues serving his community through involvement as a Scout Master and working with challenged and handicapped children. 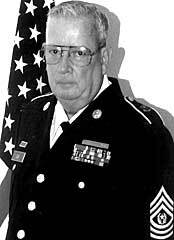 Command Sergeant Major Day served with great distinction in the Texas Army National Guard for over thirty-five years. Recognized as a true leader, of the finest quality, he continues promoting the National Guard through his selfless an unending community service.